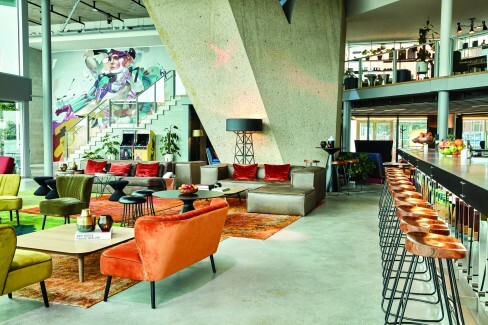 Sir Adam, located in the iconic A’dam Tower, on the Amsterdam IJ-river waterfront is a super-cool modern hotel that is broadly based on the principle of ‘less is more’. That said, this in no way translates into less bang for your buck. The Butcher social club, a pulsating lounge comprising of a gourmet burger joint, an island bar with live DJ sets, and a river terrace with mobile bar, does the job of welcoming the hotel guests. 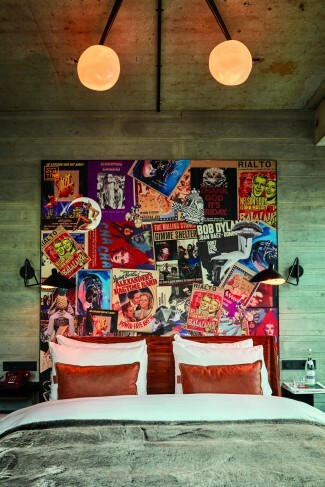 Bare surfaces, super-cool décor accents with retro music as the underlying theme and a to-die-for location makes it one of the hippest hotels in all of Amsterdam. 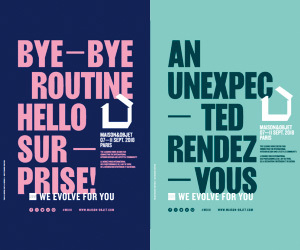 So prominent is the emphasis on music and liveliness that the elevator itself is a mini-disco, sending you dancing to your room or the way out! 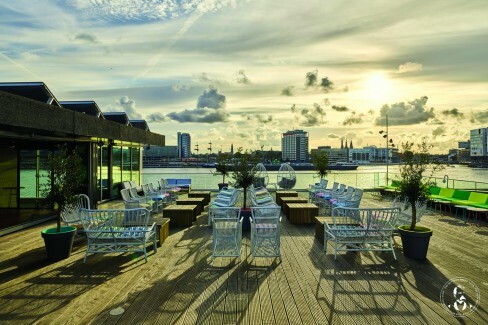 A funky member of Design Hotels™, it stands on the quay behind Amsterdam Central Station at a vantage point providing wonderful, panoramic views of the river IJ. The ceiling and walls of the guestrooms are left unfinished with the concrete surface showing. 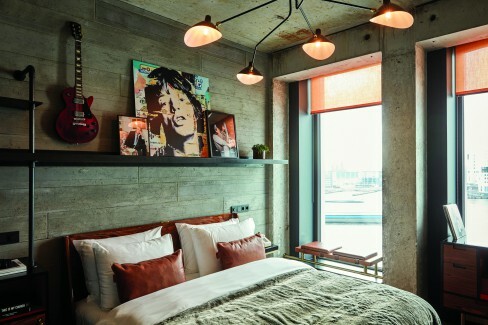 Music related artwork, hip design elements and lighting promote the non-conformist look. Best of amenities and comfortable furnishings make the rooms a complete package. The river features a never-ending parade: anything from tiny dinghies to huge cruise ships, from expensive yachts to priceless tall ships, and from glass-topped tour boats to cargo ships. Quite unselfconsciously funky, Sir Adam is surrounded by many off-the-beaten-track places to chill and relax and is also kept company by a growing number of unique restaurants, the world-renowned EYE Film Museum, and world-class music venues. Atop the A’dam tower lies Madam, Amsterdam’s highest nightclub. Accompanying it is the Lookout observation deck, the subterranean nightclub Shelter, and a rooftop swing. Operated by EHPC, the Sir Adam Hotel offers 108 guestrooms with stunning views of the historic city. Award winning designers Icrave were entrusted with the design of Sir Adam’s 108 luxurious guestrooms and public spaces which are dotted with carefully curated works of local artists, custom-made furniture and lighting dedicated to upping the cool quotient. Elements such as a Crosley Cruiser record player and mirrors etched with song lyrics reinforce the overflowing artsy aesthetic further. Bathrooms are outfitted in Calacatta tile and feature rainfall showers and signature ‘Dead Clean’ amenities. Corner rooms also boast full-length windows overlooking the capital’s historic center and pulsating port. The hotel lobby at Sir Adam again doesn’t walk on the beaten track, instead it is a space based on minimalism and geometry with a whole lot of edge thrown in. The Butcher social club, a pulsating lounge comprising of a gourmet burger joint, an island bar with live DJ sets, and a river terrace with mobile bar, does the job of welcoming the hotel guests. Featuring a two-story living green wall and dotted with original artworks, game tables, and swing seats, the open, flowing space is a versatile and eclectic spot suited for both the guests and the well-heeled locals. 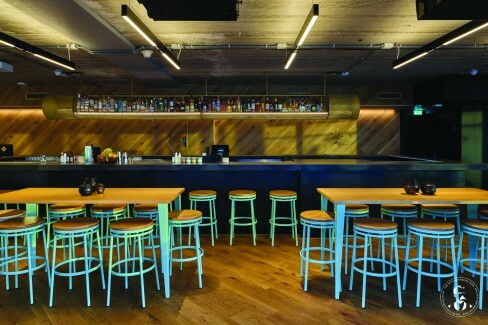 On the mezzanine overlooking the Butcher social club, music aficionados will find their Mecca at the Hub, a co-working space-meets-concept venue. The corner rooms at Sir Adam enjoy enthralling views of the IJ River and the city beyond. Elements related to music such as a guitar and images of iconic singers reinforce the funky vibe. The hotel’s neighbors within the building include the internationally renowned guitar manufacturer Gibson, music and entertainment companies MassiveMusic and ID&T, and a medley of young creative companies with a passion for music. At the top of the A’dam tower is positioned Madam, Amsterdam’s highest nightclub. The building is also home to a mix of shops, cafés, offices, a revolving rooftop restaurant, the Lookout observation deck, the subterranean nightclub Shelter, and a rooftop swing that sends adrenaline junkies flying above the water below. 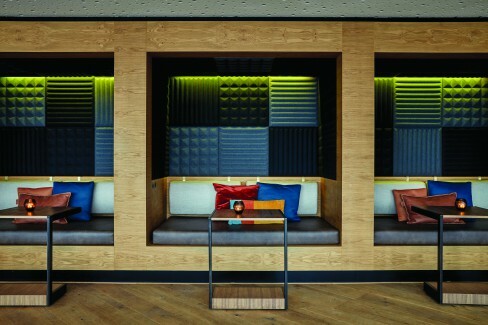 Other exciting places to spend time in while at the Sir Adam Hotel include a state-of-the-art gym, the restaurant Beergarden on the second floor, and cool, creative studios where guests can collaborate-perfect for small gatherings, product launches, photo shoots, receptions, meetings, and more. Just dripping with style and all that is artsy and cool, Sir Adam underlines its focus on music with a ‘music library’ in the lobby. 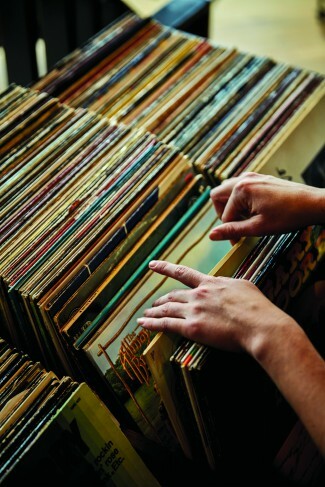 Full of carefully curated tracks, guests are encouraged to pick up their choice of classic old LP’s and play them on the Crosley Cruiser record players in the privacy of their rooms. With the wonderful convenience of the free ferries that weave their way in and out between the other vessels to cross the IJ, guests at Sir Adam are spoilt with the best options for recreation and sightseeing in both Amsterdam-North and Amsterdam-South. Many guests rent bikes and head for the beautiful countryside around Sir Adam instead of choosing to combat the hordes of tourists and traffic of Amsterdam-North. Interior spaces are based on minimalism and geometry with a whole lot of edge thrown in. The vibe at Sir Adam is young, energetic, vibrant and very contagious, so if you are visiting Amsterdam, Sir Adam would be the most interesting and convenient location from which to explore all of it at your very own pace. A combination of style, energy and heartfelt hospitality, your stay at Sir Adam, at its end, is sure to leave you with a song in your heart and a smile on your face!